ATEX, derived from ‘ATmosphere EXplosible’ was extended from electrical equipment to cover mechanical equipment such as fans and came into force under Directive 94/9/EC on 01 July 2003. Only equipment, components and protective devices may be placed on the market which conform to the provisions of ATEX directive 94/9/EG. Vertical layout, all components in die-cast aluminium, with liquid gasket and double seal ring, a lantern for direct coupling and tap for condensate. Atex certified flexible coupling. Anti-sparkling guard. Asynchronous electric motor ATEX CE CAT II 2G Eexd IIB T4 IP55 cl. “F” with PTC. Base plate in carbon steel. Gas-tight construction, horizontal or vertical layout, Atex certified flexible coupling, anti-sparkling guard, twin bearings, Viton seal ring. Asynchronous electric motor ATEX CE CAT II 2G Eexd IIB T4 IP55 cl. ”F” with PTC. 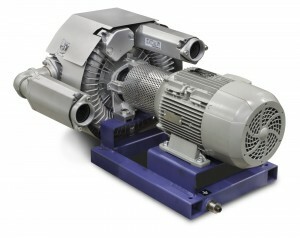 Side channel blowers and exhausters Monoblock type ATEX II 3GD – zone 21 and 22. All components in die-cast aluminium, monoblock construction, horizontal or vertical layout. Electric motor ATEX CE II 3GD Ex nA T4. IVACO Srl has designed and subjected all ATEX products to a rigorous ignition hazard assessment to determine correct design features (including a selection of compatible materials) and in conjunction with an authoritative standard. All air blowers are subjected to a running test and some our fans are given an extended test run under closed damper conditions to verify & record maximum surface temperatures.